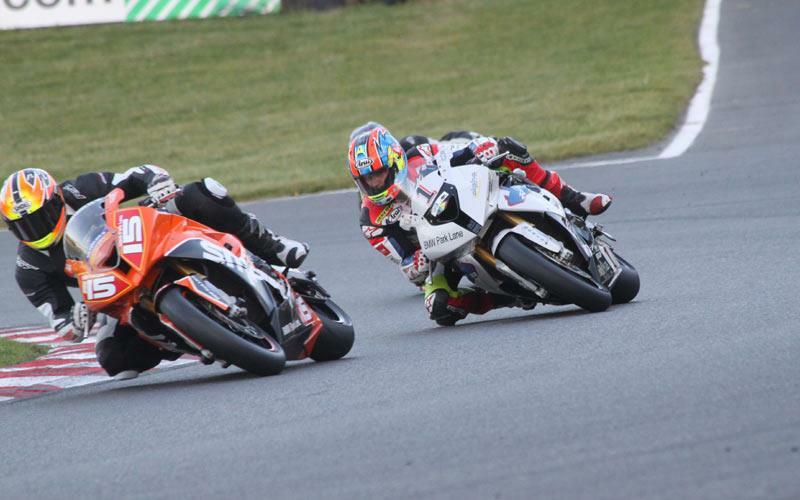 I thought it would be a nice easy end to the season, but the final round of Bemsee’s Respro Premier 1000 championship at Brands Hatch, turned out to be a real rollercoaster. Just two sessions into free practice, I have my first big crash in years. 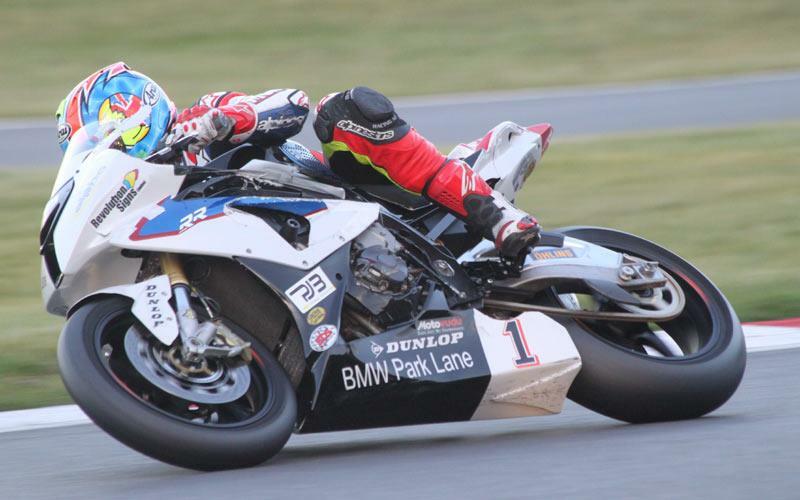 A cold rear tyre catches me out on the way into Graham Hill, off the throttle - my BMW Park Lane S1000RR goes sideways as I tip in and throws me unceremoniously over the high-side. I land hard on my back and then have a bit of a tumble, but get away with no more than bruises. I’ve got to thank my Alpinestars kit for saving me, especially its excellent body armour, back and chest protector. 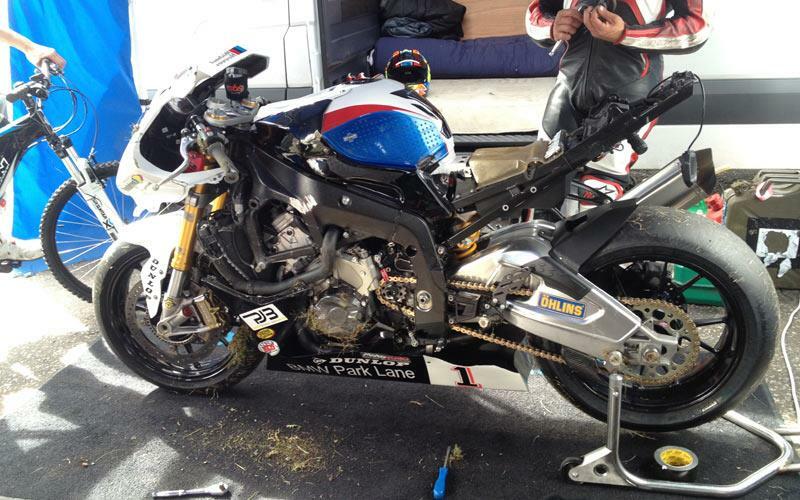 My bike, complete with its new No.1 plate, thanks to our championship win, doesn’t come off quite so well. I’ve kept it pretty all year, but I’ve broken all the sticky-out bits off the left hand side and smashed the bodywork. We replace as much as we can with new parts, but have to duct tape the plastics back together – the world is held together with the stuff, after all. With new Dunlop Ntec slicks fitted it’s out for qualifying and the bike doesn’t feel right - the front feels like a jackhammer and I can only manage 10th on the grid. Checking the bike over back in the pits we see that the upper left fork leg has been crushed by the racing lockstops and the forks are stuck solid half way down their stroke. Fortunately BMW Park Lane service the Bemsee paddock with spares and technical assistance, so it’s a big thanks to Park Lane’s Nick and Jason for replacing the upper fork tube – a job I couldn’t possibly manage by myself. With the front end back together just in time for the feature race, just riding the warm-up lap lets me know everything is as it should be - it not longer rides like a digger and it’s back to having the ride-quality of a Rolls Royce. This race is my first proper run on the bike all weekend, so a steady fourth behind Barry Chapman, James Edwards and Jon Waghorn is good for the confidence. As well as my two scheduled Premier 1000 races I decide to do two ‘Open’ races today, to make up for all the lost set-up time in Friday practice and Saturday qualifying. I’m using lighter OZ forged aluminium wheels this weekend and they make a big difference to feel and make the bike easier to turn. I can run lighter damping settings with the new wheels and that compounds the feeling of lightness and makes my Beemer feel like a proper racer. The first Open race I have to start from 32nd and the 8th row of the grid, but get through to finish 6th. It’s disaster for the first Premier 1000 race. I’m supposed to be starting on the front row but I’m told to start at the back after arriving in the collecting area late. Like a few other riders, I don’t hear the final call for our race and we’re told we can’t form in our proper grid positions. Some go to their grid positions anyway and I start from the back, like a good boy - so I’m pretty miffed that a chance for a race win is out of the window. In the 10-lap race I go from last, to finish third. Starting from sixth on the grid I finish second in the next Open race, which leaves the final race to battle for the race win and the chance to finish the season on a high. This time last year I lost the championship to Rob McNealy by 500th/sec over the line – I knew how John Hopkins felt a few weeks later at BSB. The final race is a battle for the lead between James Edwards on his superstock Fireblade. It’s a great fight and right the way through the race – we’re evenly matched in most places, but he’s really strong braking for Paddock and I have the advantage through Clearways and on to the straight. Using my Beemer’s extra speed along the straight and taking a wide entry into Clearways on the last lap for a perfect drive, I managed to get HMS Rocketship ahead at the line by 200th/sec. Apologies to Edwards who deserved the win, but I guess that’s karma for last year’s disappointment. In the end it’s a perfect end to a perfect season. I started and finished with a win and took the championship on the way. A big congratulations has to go to Michael Honey for winning the Rookie 1000 championship and Mark Fincham for riding out of his skin to take runner-up spot and win the final race of the year. Also, get well soon to Danny Campion after his horrendous road accident a few weeks ago. Here’s hoping for a speedy recovery. This racing malarkey can put a lottery winner out of business and it’s never possible without the help of friends, family and sponsors, so it’s a huge thanks to everyone that’s made my racing dream come true this year, especially: Ben, Rookie, Creature, Jimbo, Mark & Ali, Keith and Simon Crafar. Bruce, Paul, Nick and Jason at BMW Park Lane, Ryan at Revolution Signs, Pablo at PJB Technical Services, Warren at The Mercer, Bob at Icom, Dunlop tyres and SBS brakes.